So, remember last September, when I said that Atlatl's body shape was tentatively finalized? Lol! After properly enlarging the head and reattaching it to the body, I realized that there were still more changes I wanted to make. I added two more hoops to the neck, to give it a smoother curve and more "points of articulation," as action figure makers say. Based on a sketch I'd done, I also decided to make the neck thicker -- which made him look much more like a real animal -- and to re-add one of the body hoops that I'd previously taken out. I'd been having trouble figuring out the right size and position for the bottom hoop. But why reinvent the wheel when I could use Big Bird for reference? 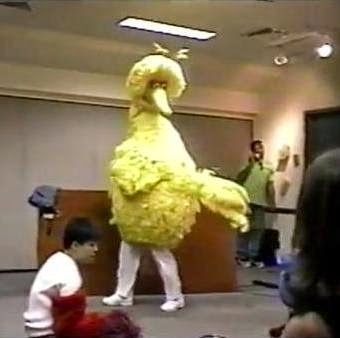 The picture above is from a video posted by the makers of the upcoming Caroll Spinney documentary I Am Big Bird. (Did you donate to the Kickstarter? I did!) 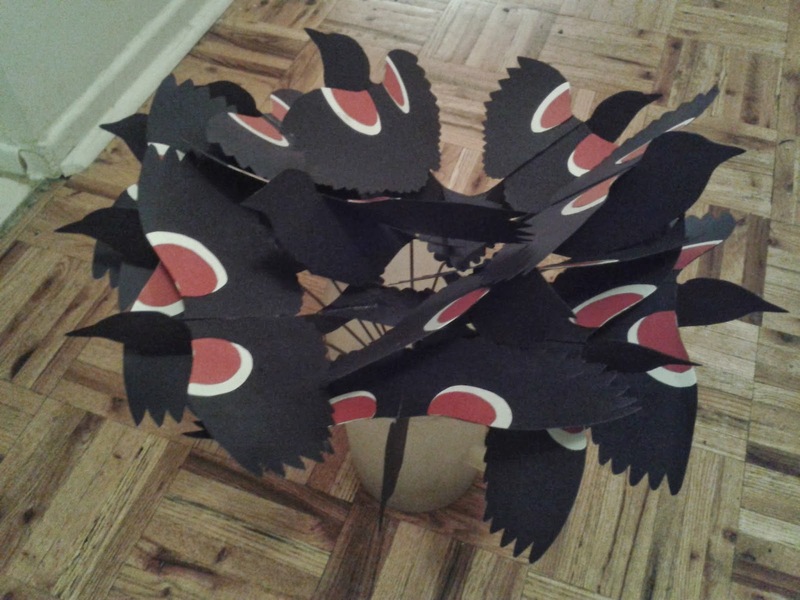 Without the bird legs on, it's easy to see how big the bottom hoop is, and where on Spinney's legs it sits. I based my own bottom hoop on that. Pixie helps me adjust the hoops. Photo by Suzanne Harding. 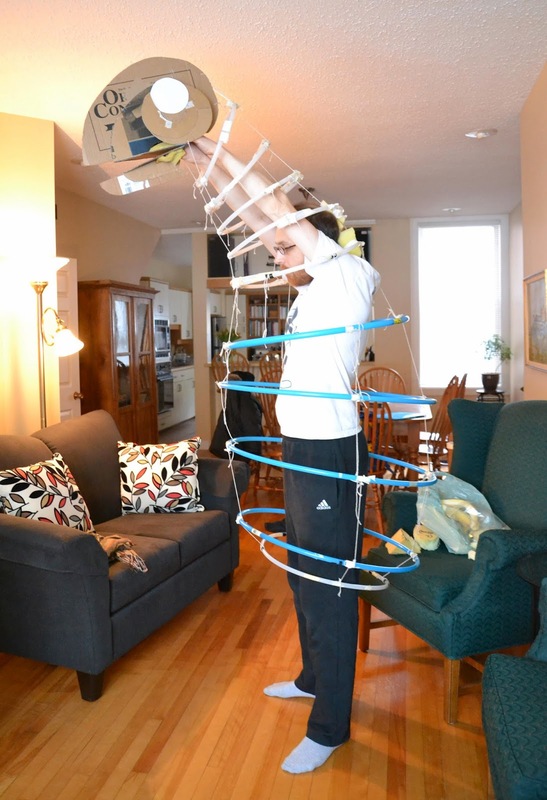 It's incredibly hard to adjust the hoops from inside while I'm wearing the puppet. So once I'd gotten things about 90% of the way there, I asked my filmmaker friend Pixie Cram to help get them exactly where I wanted. And here it is. Looks better, doesn't it? Now the body shape is tentatively finalized. 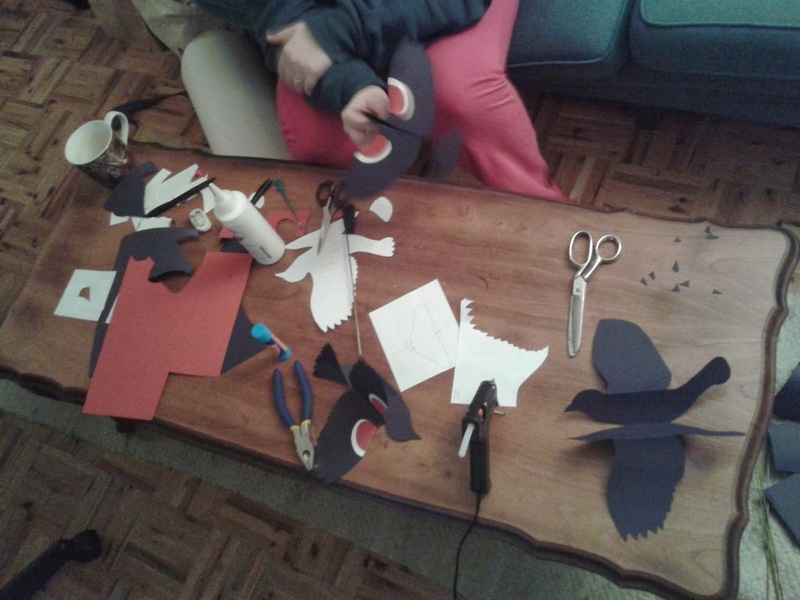 Julie and I are hard at work making red-winged blackbird rod puppets for our wedding in September. Instead of throwing confetti, every guest is going to have one of these, to jiggle and "fly" as we walk back down the aisle. Thirteen down, lots more to go! We're going to enlist our friends to help at a crafting party sometime before the wedding. I'll also be teaching kids to make their own in a craft tent at Chinatown Remixed this May. "big bird and little bird"